Monday’s plan was to troll at the hump then back to the deep drop. Smooth ride out meant there would be a lot of boats out there. Approaching we see birds and get the spread out. Seeing many birds but no tunas jumping. Could be all the boats trolling at 20mph chasing the birds. Most were trolling, only a couple drifting and not much catching going on. After making several laps we finally have a double on. I am set a course to get away from everybody while we fight these two. The one is pulling hard and had my 30 wide is maxed out. Marty’s is coming easier which was good because it was on a small conventional. I had to put the Penn 30VSX in low gear to gain line. At first I though maybe a shark got it but the longer the fight went on with no cut off we became more optimistic that is was a big tuna. Marty’s made a jump and spit the hook but it looked like a bonita. I am still cranking on mine but it felt like dead weight. As it gets closer to the boat we can see that it got tail wrapped and was coming backwards. Jumbo skippy goes in the box and we leave the crowd. Only five miles to deep drop spots which means they are still in the gulfstream current. Make a couple drifts with 8 lbs again and pull up a nice tile on the second one. Couple more difts and having a hard time holding bottom. Harlan (Piner Wahoo) from American Allegiance Charters was in the area and haled us on the radio. He was out doing the same thing but found an area with less current not far away. We moved about a mile north and current was moving at only 1 knt. 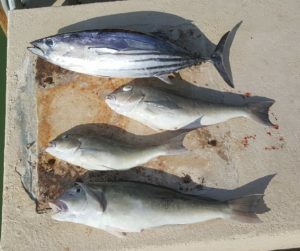 We worked this area for a while the catching was slow but we put two more tile fish in the box. With the freezer already full we had caught enough for a couple good meals. So it was time to take the beautiful ride over the reef and back to the dock.